Sit back and relax while the end of the world unfolds in these luxurious bunkers. Doomsday preppers get a bad rep with their underground bunkers, stockpiled canned goods, and 10 Cloverfield Lane send-ups, but it’s not the working-class, flannel-wearing survivalists of middle America who are the most paranoid about society’s unraveling; it’s reportedly the super-rich. That is to say, billion-dollar megastructures are springing up all over the globe, promising salvation and survival without sacrificing luxury. Drilled into the side of mountains or buried in the earth, these facilities are truly high-tech masterpieces. Here are ten ways the world’s rich will live after the world ends. The underground control/communications center inside The Oppidium. When surviving the apocalypse, billionaires want the finest security measures: encrypted locks with retina or fingerprint scans, vocal recognition systems, and infrared cameras. The Oppidum, a shelter carved into the side of a mountain in the Czech Republic, promises the utmost in safety with automated defense technology and a communications center that controls the entire facility. You can’t even access The Oppidum website without a secret code. Inside the Survival Condo, the walls are up to 9 feet thick. What use is a high-tech security system if the building’s walls aren’t fortified? The Survival Condo, a converted underground Atlas “F” missile silo in Kansas, has nine-foot-thick walls and sealed entrances. The structure can withstand just about any imaginable disaster, including a direct hit by a nuclear bomb. Once the billionaires make it out alive, they will have to repopulate the world. 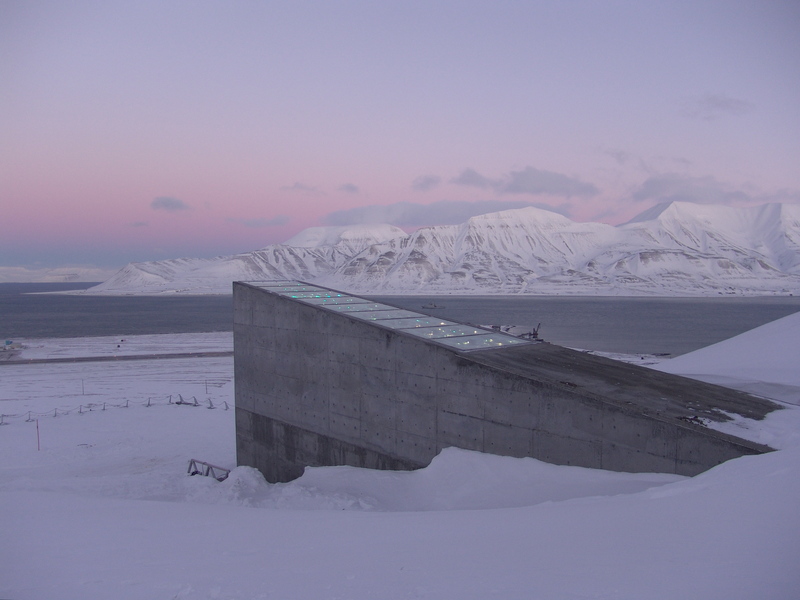 The Svalbard Global Seed Vault is drilled into a mountain on a remote island off the coast of Norway. It safeguards some 800,000 seed varieties so that if catastrophe strikes, the world still has a way to cultivate anew. Vivos also claims to have the first “Global Genome Vault” where you can store your precious DNA for free. Hydroponic gardens inside the Survival Condo. When the planet’s a wasteland, residents in these bunkers may have to survive for up to a decade while the dust settles. In addition to a five-year supply of food per person, the Survival Condo is equipped with hydroponic and aquaculture systems to grow a constant supply of fruits and vegetables. Vivos Indiana is equipped with a diesel generator. To power these luxury dens, a fully autonomous energy source is essential. Vivos Indiana, a complex for 80 lucky 1-percenters, has a diesel generator with a year’s supply of fuel. Other such facilities, like the Survival Condo, have solar panels and wind farms above ground, assuming they are not destroyed by marauding aliens or gangs controlled by warlords. The Knight XV is ready to help you survive the apocalypse. Vivos Europa One in Germany — an underground “Noah’s Ark” for the most elite billionaires — boasts all kinds of terrain vehicles including helicopters and armored security vehicles. Though they don’t mention any specific vehicles, there are a few on the market that would be suitable for traveling post-apocalypse. The Conquest Knight XV is basically a tank on wheels. Powered by biofuels, the Knight XV marries luxury and safety, including ballistic glass, sirens, an oxygen survival kit, night vision cameras, and a satellite flat-screen TV. LED TVs and lights inside a suite at Vivos Europa One. Even with autonomous power generation, these megastructures still have to sustain as much energy as possible. With a lifespan of ten years or more, LED lights and televisions will be essential. Europa One combines elegance and efficiency with LED systems. The medical facility inside The Oppidium. A medical division is critical for any proper doomsday shelter, especially if a virus is the culprit. The Oppidum has a fully operational facility, most likely stockpiled with medicine, too. Now the question is, who gets to be the doctor on board? Vivos Europa One water treatment plant. As Mad Max: Fury Road taught us, water, aka “aqua cola,” is the key to survival. Each facility must have a water purification system, especially if freshwater reserves are contaminated by radioactive waste. Europa One has a water treatment plant with deep water wells. Likewise, the Survival Condo has 75,000 gallons of water and its own filtration facility. A community pool inside the Vivos Europa One shelter. But most of all, any good luxury bunker must have top-of-the-line amenities so millionaires can relax and forget about the end of the world for a while. Swimming pools, dog parks, arcades, rock climbing walls, movie theaters, bars, and wine cellars (pictured below) are just a few of the recreational facilities residents can enjoy.